Mediahuis is the largest media company in Belgium, with an impressive portfolio including four well-known daily Belgian newspapers—Het Nieuwsblad, De Standaard, Gazet van Antwerpen, and Het Belang van Limburg—and dozens of websites that reach more than 1.3 million news consumers on a daily-basis. As traditional news continues to become increasingly digital, testing allows Mediahuis to build a more data-driven culture and to optimize their online news experience. Web testing has been highly successful at Mediahuis for a few key reasons. First, they created a centralized team that focuses on testing company-wide, enabling them to run frequent experiments and centralize their learnings within the organization. Testing has also allowed them to make quick decisions without wasting time and resources on building features that may not test well. And finally, they're able to use the testing data to make smarter business decisions and become more insights-based as a company. Mediahuis has a centralized Traffic Center to support the editorial, marketing, and sales teams at their news publications in running tests. According to Yves Van Dooren, Manager of the Digital Traffic Center, "our publishers are continually asking us questions, and now we can run tests and give them results based on real numbers." Van Dooren works closely with Traffic Specialist, Koen De Keersmaecker to test existing content on their news sites. Their goal is to eventually test content before it rolls out. "Right now we're testing for learning and to convince the right people—we want to get rid of testing by gut feeling and to become more data-driven," Van Dooren adds. Paid subscription is a key revenue driver for the Mediahuis business, so Van Dooren and De Keersmaecker first focused their efforts on optimizing the subscription experience on the subscription pages. Their initial hypothesis was that they would see an improvement in click-through rates if they improved the outdated designs on these pages. Using Optimizely to run several experiments on the page design, they quickly realized that design changes had no impact (in fact, the changes they made actually had a negative impact) on the results. Thanks to these quick tests, they were able quickly adjust their strategy without wasting any time and shifted their focus to optimizing other parts of the subscription page. Based on a recommendation from Optimizely, Mediahuis decided to test the placement of new copy within their pages. The results were an uplift in click-through of more than 50% compared to all previous tests. 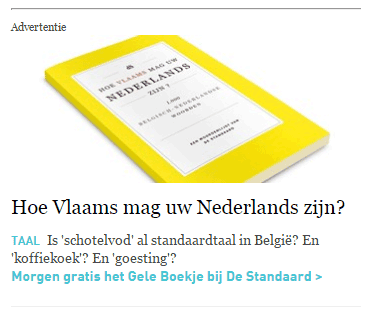 "From a learning standpoint for us, that was a real eye opener—it's not just the design of the page but also the copy and how the copy is placed on the page," said Yves Van Dooren, Manager of the Digital Traffic Center. Van Dooren and De Keersmaecker saw some of their best results on the experiments they ran on their advertising formats for their online shops. The original types had very poor click-through. They ran experiments in several locations on multiple pages and found that new versions increased clicks up to 353%. The results were clear – The original advertising formats weren't working. They needed to re-think their guidelines, and the results from this experiment gave them the data they needed for that discussion. The images above show examples of the advertising formats that were tested across multiple pages. With the results from these experiments, Van Dooren and De Keersmaecker are able to help Mediahuis publications make smarter decisions about the content on their sites. They're also building support for more insights-based decision-making across the organization. "Currently we see things and we test them, but we are starting to prioritize testing and we are using the data to understand our best approach for moving forward." Optimizely will continue to be a big part of their testing strategy going forward.